The seed of the Cuminum Cyminum, an umbelliferous plant, which, coming originally from Mediterranean countries, spread to many parts of the world. 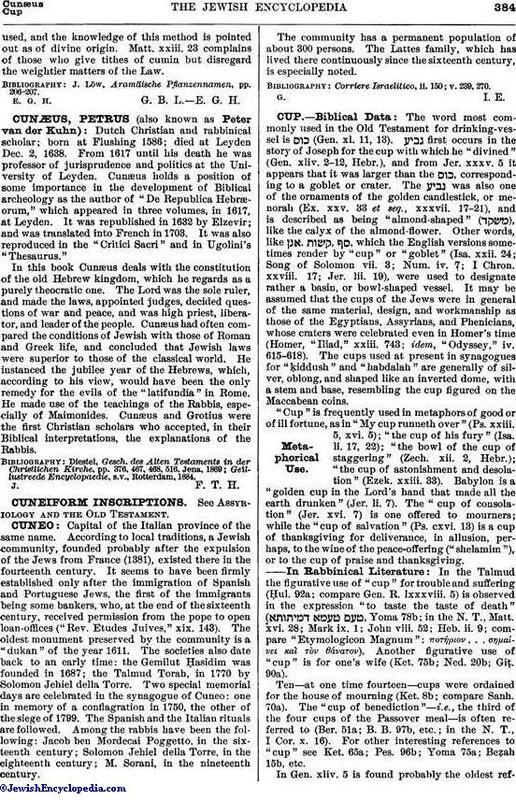 Its name is common to Greek, Hebrew, Phenician, Syriac, Ethiopic, and Arabic, as well as to modern languages. Geoponicon and Bar Bahlul mention among its varieties the wild, the Ethiopic, and the domestic or garden cumin. Palestine grew a special variety of its own, the Cyminum Syriacum (Mish. Demai, ii. 1; the Yer. distinguishes it from the variety called Cyprian, the seed of which is curved). 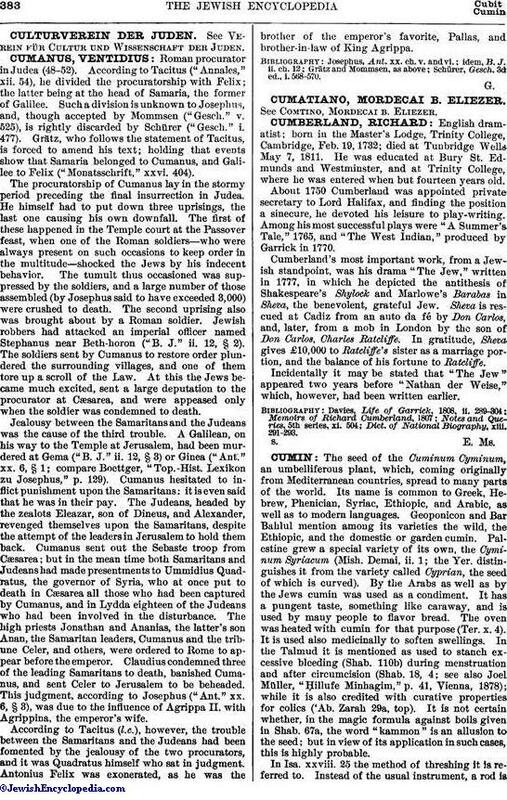 By the Arabs as well as by the Jews cumin was used as a condiment. It has a pungent taste, something like caraway, and is used by many people to flavor bread. The oven was heated with cumin for that purpose (Ter. x. 4). It is used also medicinally to soften swellings. In the Talmud it is mentioned as used to stanch excessive bleeding (Shab. 110b) during menstruation and after circumcision (Shab. 18, 4; see also Joel Müller, "Ḥillufe Minhagim," p. 41, Vienna, 1878); while it is also credited with curative properties for colics ('Ab. Zarah 29a, top). It is not certain whether, in the magic formula against boils given in Shab. 67a, the word "kammon" is an allusion to the seed; but in view of its application in such cases, this is highly probable. In Isa. xxviii. 25 the method of threshing it is referred to. Instead of the usual instrument, a rod isused, and the knowledge of this method is pointed out as of divine origin. Matt. xxiii. 23 complains of those who give tithes of cumin but disregard the weightier matters of the Law. J. Löw, Aramäische Pflanzennamen, pp. 206-207. E. G. H.G. B. L.E. G. H.